API is the majority shareholder of the joint venture between TITRON Group of Hong Kong and BMT Group of the UK. BMT TITRON (UK) Ltd (BTUK) operates globally from its Ship Design Centre, close to the River Tyne in Newcastle upon Tyne, UK, a historic maritime location. BTUK uses the latest design technologies and innovations to design and develop specialist ships and marine transport. BTUK is a specialist in bunkering and transportation of LNG – ranging from 3,000m3 to 17,000m3 and transportation of up to 40,000m3 for local markets. The association makes API a leader in logistics and technology in maritime and infrastructure solutions, particularly in the LNG sector. BMT Group is a leading international design, engineering, science and risk management consultancy with a reputation for engineering excellence. BMT believes there is always room to refine and improve – setting new standards in safety, speed and efficiency. With around 1,500 professionals located in 66 offices in Europe, Asia and the Americas, BMT draws upon a wide range of experience and expertise to provide high-quality, high-value products and services. BMT’s combination of intellectual rigour and commercial insight has helped the Company to play an important and increasing role in industries as diverse as oil and gas, defence, renewable energy, ports, risk management and maritime transport. Energy Global was founded by Frederick Jones, a 40-year veteran of the international commodity trading business, to consolidate his investment and operating interests in the world-wide energy sector. In 1974, Mr Jones was a founder shareholder of Marc Rich & Co A.G., Switzerland, which today is known as ‘Glencore Plc’, the largest company in Switzerland by revenue (US$205 Billion, 2017). Mr Jones has also founded and developed other Asian energy businesses in the infrastructure sector. API has a strategic alliance with Energy Global to access the considerable experience and acumen of Mr Jones in developing API’s commodity trading and global energy investment projects. Mr Jones also founded “Delfin LNG” in 2013, a company focussed on developing energy infrastructure assets in the United States of America. Delfin LNG is developing the first floating liquefied natural gas production vessels (FLNGVs) in North America and is fully permitted by the United States Department of Energy to export U.S. natural gas in liquefied form to countries having Free Trade Agreements or Non-Free Trade Agreements with the United States. The project consists of an existing subsea pipeline that will transport U.S. natural gas from Cameron Parish, Louisiana to the Delfin LNG Deepwater Port, which is located up to 50 miles off the coast of Louisiana and will be the site of up to 4 FLNGVs. API has a capacity agreement to utilise Delfin LNG’s export pipeline to supply its clients’ LNG. China POLY Group and GCL Group have been long term partners and co-founded POLY-GCL Petroleum Group Holdings Limited (hereinafter referred to as “POLY-GCL”) to develop the oil and gas project in the Federal Democratic Republic of Ethiopia. POLY-GCL specialises in the integrated business of oil and gas exploration and development, production, storage, pipeline transportation, processing and customer-end distribution and sales. API has a joint venture company with POLY-GCL. API provides market strategy solution to our Alliance partners in Ethiopia, North Africa gas field development. Our partnership in API POLY-GCL continues to improve our position and bring new value to our off-take customers around the world. Marketing management for off-taker agreements and order processing. API along with POLY-GCL continuously seek market trading opportunities in the Energy sector to bring added value and deal flow to the Far East. Cypress Eagle LLC is a Texas registered company which acts as a gateway for the purchase and sales of crude oil and related products such as liquids, natural gas, NGLs and condensate. Cypress Eagle also handles logistic management, midstream connectivity and access to premium downstream domestic and export markets. Cypress Eagle is one of API’s strategic oil and gas supply and trading partners. 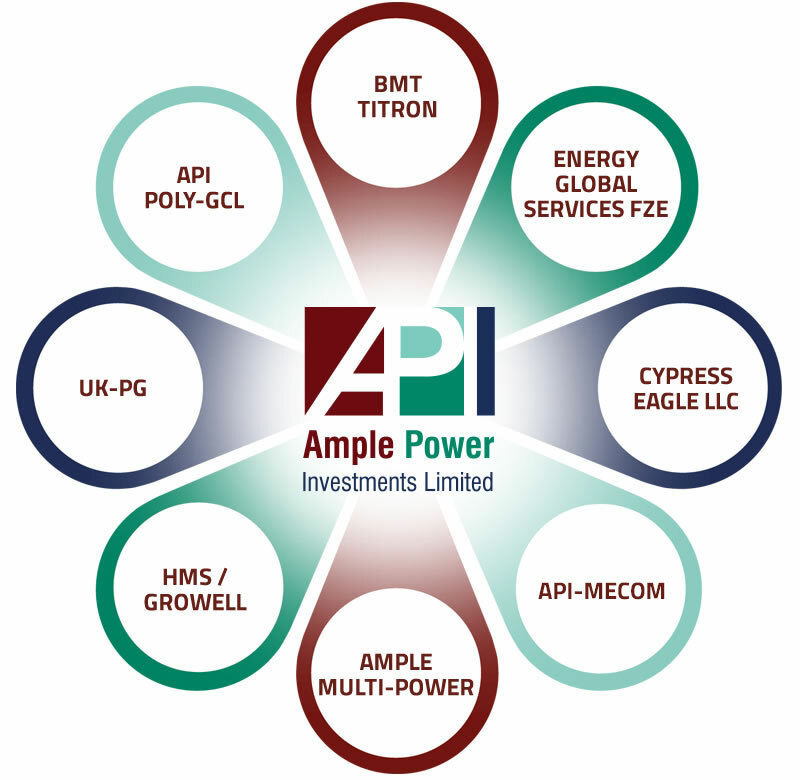 API has an alliance with Cypress Eagle for midstream gathering of US crude and liquids for the domestic market. Steeped in history, dating back to 1890s when Harvey and Louise Mecom became shareholders in the Texas Company later renamed “Texaco”. The Mecoms shared undivided mineral interest with Texaco in Cameron & Calcasieu parishes and neighbouring Texas counties. The Mecoms still own vast swaths of land to this day with proven mineral reserves ripe for development. API has a joint venture company with the Mecom family in order to develop 25,000 acres including existing production as well as new drill opportunities for North American oil and gas upstream projects. Ample Multi-Power is a joint venture between API and MPF Asia Pte Ltd, focusing on owning and building multi-purpose floaters (MPFs). Ample Multi-Power is a co-owner of the MPF-01 – the world’s largest MPF constructed, based on propriety of MPF technology by Wilhelm P. Blystad. HMS Bergbau AG, established over 40 years ago, is a globally operating company specialised in reliable, ‘just-in-time’ deliveries of coal products to power stations, cement producers and other industrial consumers. Growell Resources and Management Pvt. Ltd. (Growell), is an India-based company specialised in the field of exports and imports of various commodities such as fertilisers, chemicals, minerals, metals, steel, petroleum products, cement, and coal. Growell has been trading since 1990. API, HMS and Growell have a joint venture for the development of coal mining assets, as well as global coal trading. UK-PG develops LNG to power generation projects in the UK to supply the main National Grid as well as local Industrial users.